Hello SOLF Wildlife Survey Volunteers! Training Workshop, Monday April 13th at @ 4 PM. The salamanders and frogs are already on the move! We need to get our volunteers trained so you can sign up to fill survey time slots. Training Workshop, Monday April 13th at @ 4 PM, Southborough Library, Meeting Room Lower Level, Across from Children’s Room. Starting at Library for Classroom Demonstrations and Discussions, then going over to Beals Preserve for Hands-on. All volunteers will need to attend a training before signing up for shifts. For more information on the Wildlife Survey, click here. 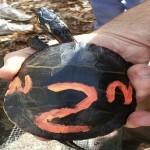 The wildlife survey project currently ongoing at Beals Preserve is focusing primarily on reptiles and amphibians. 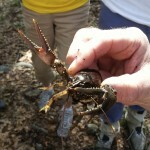 But a number of other species have been observed by project volunteers. Here is a listing of these observations to July 30, 2014. Thank you volunteers for all the time and effort you have put into this project and the wide variety of observations you have made. 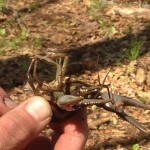 In March of this year, SOLF began a wildlife survey of reptiles and amphibians at Beals Preserve. The project was originated and is being directed by SOLF member Lawrence Spezzano of Southborough with the generous assistance of wonderful volunteers from Southborough and other communities! Lawrence reports that after two months of data collection, amphibian diversity has been impressive with 7 frog species and 4 salamander species found, which is nearly 50% of the 23 species recently documented in Massachusetts. 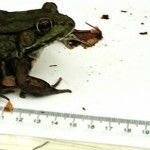 Frog species found, collected in, or near, the transects include: American Toad, Spring Peeper, Green, Grey Tree, Pickerel, Leopard, and Bullfrog. 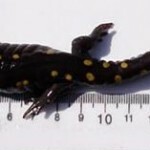 Salamander species found include Red Back, Dusky, Four-toed , and Yellow-spotted. Reptiles have been more rare so far, in this generally cool spring, with 12% of 24 species observed including the more cosmopolitan Painted and Snapping turtles and Garter Snakes(no surprises, there!). Going forward, June and July should provide more wonderful examples of local reptiles as the WHIP plywood transects provide ideal cool and humid microhabitats. Lawrence expects the warmer weather to draw out more activity and the volunteers have already begun to see evidence of this when piloting turtle traps in the Ice Pond, finding discarded skins and and observing reptiles basking. SOLF volunteers will continue to collect evidence, including bird, mammal, insect and plant diversity, over the course of the summer and fall. More volunteers are needed, so contact SOLF at info@solf.org, if interested. These invaluable data already suggest relationships among species, their gender, length and mass, which could drive future conservation efforts in Southborough and neighboring towns! Could the Beals Preserve be a major resource supporting salamander maturity, frog reproduction and reptile hibernation for populations throughout central Massachusetts? Stay tuned! You can see some photos of the survey below. 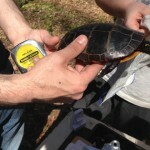 The SOLF Wildlife Survey project encountered a female Eastern Painted turtle with an ear abscess near the pond at the Beals Preserve on May 11. 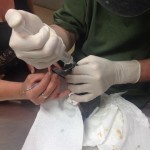 The images show it being treated by Dr. Greg Mertz at the New England Wildlife Center in Weymouth. Are you interested in salamanders? If you are interested in salamanders and more information about them, here is a link to the Partners in Amphibian and Reptile Conservation. 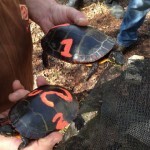 The images below show volunteers checking the turtle trap at the ice pond at Beals Preserve on May 11. 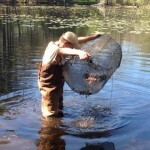 Three painted turtles, a crayfish, several bull frog tadpoles, and some shiners were found. After being documented, they were returned to the ice pond. SOLF is planning an exciting new multiyear census of the wildlife inhabiting our open spaces. Beginning in spring 2014, SOLF will begin a census of the amphibians and reptiles that inhabit Beals Preserve. Currently, little is known about the density of these species on Beals Preserve. Our objective is to measure the species composition and density of reptiles and amphibians on this property and to determine its role in sustaining local amphibian and reptilian populations. The project is being planned and guided by Southborough resident and SOLF member Lawrence Spezzano Jr. The project will involve community volunteers and local educational institutions. As the project comes closer to implementation we will be seeking volunteers both to put the project in place and to make regular counts of the species observed. SOLF is always in need of volunteers who wish to donate a gift of time to open space preservation in Southborough. If you would like to volunteer to help us in any way please email info@solf.org. Beginning March 29, we will place observation sites at regular intervals at a pond edge and meadow to provide a sample of amphibians and reptiles that live on Beals Preserve. Because amphibians and reptiles use their habitats in different ways and can be active both day and night, we are calling on volunteers to help us collect data 3 times daily (9-10 am, 2-3 pm and 7-9 pm (just after dusk). This exciting opportunity will both provide valuable insight into how our preserve is being used by reptiles and amphibians and provide a unique chance to explore nature and its remarkable diversity. All Volunteers will be provided training and support as needed. Volunteers under the age of 18 will require parental permission and if under the age of 14 will need to be accompanied by an adult. Attending a training session will be mandatory. Volunteers are responsible for transportation to and from the Beals Preserve. Review of safety precautions including methods to avoid exposure to ticks and poison ivy. How to look for herps while walking along installed transects. 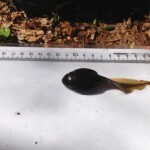 Observation and data collection of specimens collected in sunken buckets including measuring, weighing, and taking pictures before releasing. Overview of record keeping: data on total number of individuals, individual mass, length, and gender before release of the individual. Instructions on safety guidelines on how to handle amphibians and how to proceed if dead animals are found. 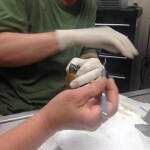 We are aware some volunteers may be fine handling frogs and salamanders but not like snakes. We can schedule around this preference as there are separate observation areas for snakes. If you would like to volunteer, or would like more information, please contact Freddie Gillespie. Ideally we are looking for volunteers to commit to one time slot a week but even less frequent participation will be welcomed. The project is being planned and guided by Lawrence Spezzano Jr., M.Sc., M.Ed, a Science Teacher at Boston Latin School and assisted by Dr. Acacia Alcivar Warren, a One Health practitioner and conservation geneticist.